Your chances of being reunited with a wayward pet are greatly improved when you attach this traditional round tag to his collar. The tag can be personalized on both sides, so you can put your contact information on one side, and your pets name and photo on the other. Give yourself the peace of mind of knowing that if your beloved pet does get away from you, he can be identified and returned home safe and sound. Your chances of being reunited with a wayward pet are greatly improved when you attach this adorable dog bone tag to his collar. The tag can be personalized on both sides, so you can put your contact information on one side, and your pets name and photo on the other. Give yourself the peace of mind of knowing that if your beloved pet does get away from you, he can be identified and returned home safe and sound. Your chances of being reunited with a wayward pet are greatly improved when you attach this adorable fire hydrant tag to his collar. The tag can be personalized on both sides, so you can put your contact information on one side, and your pets name and photo on the other. Give yourself the peace of mind of knowing that if your beloved pet does get away from you, he can be identified and returned home safe and sound. This dog tag has a gloss white finish that can be customized with the full color graphics of your choice to create a great promotional item, fund raiser or personalized gift for any occasion. The tag has a 1/8" diameter hole so it can be used on a chain or key ring. Your chances of being reunited with a wayward pet are greatly improved when you attach this adorable heart tag to his collar. The tag can be personalized on both sides, so you can put your contact information on one side, and your pets name and photo on the other. Give yourself the peace of mind of knowing that if your beloved pet does get away from you, he can be identified and returned home safe and sound. Greatly improve the chances of being reunited with your lost pet by attaching this 1" round tag to his collar. The tag is made of hard coated stainless steel for durability. This tag is available in five colors and there is plenty of room to personalize with names and contact information to help get your wayward friend back home. These industrial tags are made of stainless steel and hard coated for durability. 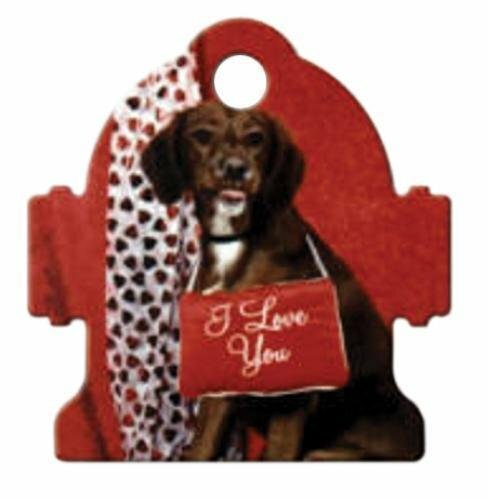 The tags are available in two sizes in black, blue, red, orange and silver, and have a 3/16” diameter hole for hanging.